August 8, 2017 - New Yorker Electronics is now distributing the ASC Capacitors new MEC-DL Line of Film Capacitors, designed for PCB board mounting. These new ASC Capacitors MEC-DL Series Film Capacitors are ideal for frequency converters, micro inverters and DC filtering applications. Their lead spacing and compact size are conducive for low inductance (<1nH per mm of lead spacing). The MEC-DL Series is available with a single lead or dual leads depending on current or application requirements. Noted for their low ESR and dry construction, the series has a capacitance range of 10uF to 100uF and voltages of 450VDC, 850VDC and 950VDC. They are housed in a PBT case with epoxy fill and metallized polypropylene. 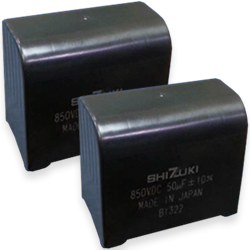 These film capacitors can be used in arrays for bulk capacitance, for placement near or around high frequency circuits. The film is also segmented to minimize capacitance loss. ASC Capacitors MEC-DL Onboard Type Film Capacitors are high-frequency, high-stability, large current capacitors designed for DC links, connecting rectifiers and inverters. They have tolerance options of either ±5% or ±10% and a VDC of either 450 or 850. ASC Capacitors MEC-DL Metalized Polypropylene High Humidity Resistant Film Capacitors for DC Link are similarly high-frequency and high-stability and are used in DC Linking and Filtering and inverter circuits for appliances. But with their high tolerance for high humidity, they are also used for industrial power supplies, wind power generation and solar inverters. They also feature self-healing and fuse action for higher safety at end of life. ASC Capacitors MEC-DL Low-Profile DC Film Capacitors are custom ordered only. The low-profile version offers a capacitance range of 13uF to 66uF, have a ±10% tolerance and come in 450VDC and 850VDC. The terminals are tin-plated copper wire and mounted in PCB through hole. ASC Capacitors specializes in custom ordering so custom sizing on all lines is always an option. New Yorker Electronics is a franchise distributor of ASC Capacitor and carries the entire line of ASC’s DC Filters, AC Filters, Snubbers, Traditional Film Capacitors and Metallized Propylene-Protected Dry Caps for HID Lighting.